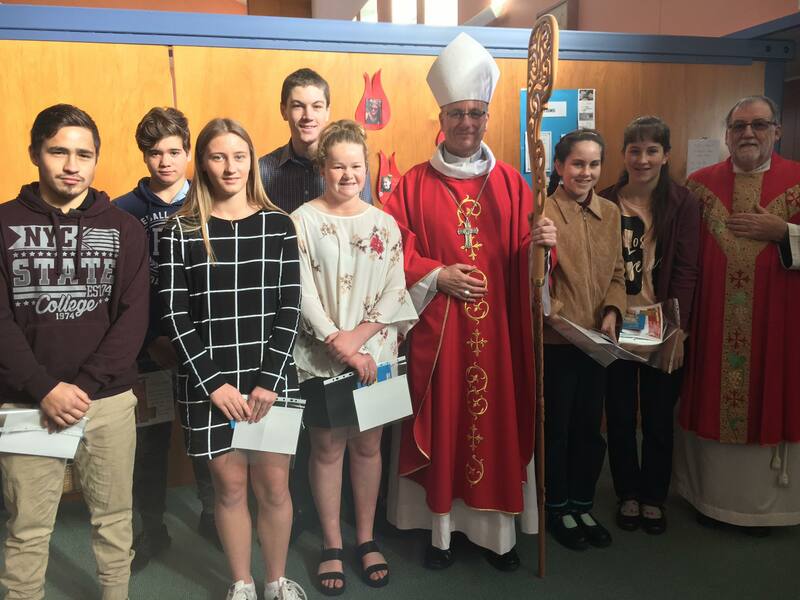 Yesterday marked the opening of the Confirmation season in our Diocese. First off the mark was St Patrick’s Patea and St Francis Xavier, Waverley with the Mass at Patea. The seven candidates included students from Sacred Heart College (New Plymouth), Whanganui High, and the Correspondence school as well as one young adult. One of the best pastoral policies I inherited from my predecessor Bishop Peter is that of the conferral of this sacrament on teenagers. Only our Diocese follows this practice in NZ and it’s a winner. The time of learning and engagement with big questions of faith by Yr 11-13 (in the main) students is relished both by them and those who lead them in the preparation programme. Thanks to all involved, and especially to our teenagers across the Diocese who in big numbers step up and take a profound step along their hikoi of faith. Complementing the Holy Spirit, Mount Taranaki yesterday morning radiated with glistening snow casting an encouraging light over Patea and Taranaki generally. Great to also see a high quality art gallery has opened recently in Patea, on the left side heading north. And our little primary school there is growing. Go Patea and Waverley!